Prototype: German State Railroad (DRG) class 92.20 steam locomotive around 1935. One beer refrigerator car, one tank car, and a type G Kassel boxcar. Model: The locomotive has a built-in digital decoder for DCC, Selectrix, and conventional operation. It also has a 5-pole motor with a flywheel. 4 axles powered. The headlights change over with the direction of travel, will work in analog operation, and can be controlled digitally. 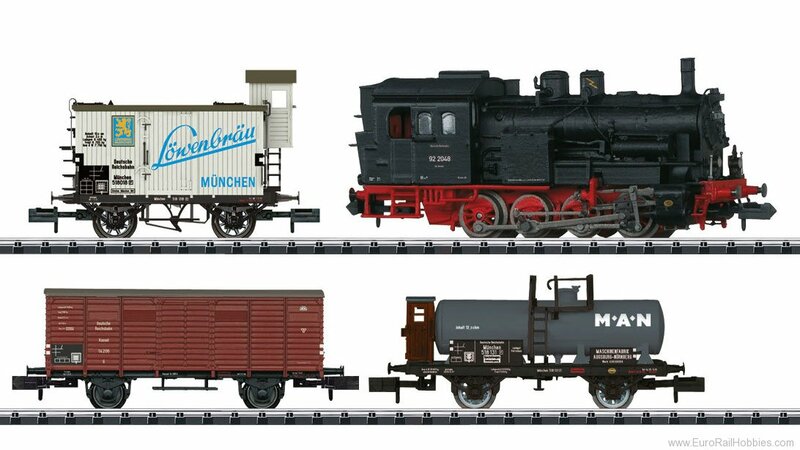 Also included is a Bavarian "Lowenbrau" refrigerator car, a 2-axle tank car, and a type G Kassel boxcar. All of the cars have close coupler mechanisms. Total length over the buffers 227 mm / 8-15/16".